GRAND RAPIDS, Mich. – SpartanNash and its Fast Lane personalized, online grocery shopping experience are expanding at-home delivery service, offering the convenience of store-to-door delivery throughout the greater Grand Rapids area. Delivery will be available on shopthefastlane.com to customers in 24 zip codes, covering all of Grand Rapids as well as Ada, Allendale, Alto, Belmont, Byron Center, Caledonia, East Grand Rapids, Georgetown Township, Hudsonville, Jamestown Township, Jenison, Kentwood, Rockford, Walker and Wyoming. To celebrate the expanded delivery radius, customers can have the delivery fee waived on their first three orders with a minimum purchase of more than $100. Fast Lane store-to-door delivery orders will be fulfilled through five stores, with each store servicing the surrounding communities. Each location will continue to offer curbside pickup as well, with no minimum purchase required. The Georgetown Family Fare, located at 6480 28th Ave. in Hudsonville, will deliver to zip codes 49426, 49428 and 49418. The Metro Family Fare*, located at 2275 Health Drive SW in Wyoming, will deliver to zip codes 49315, 49519, 49548, 49508 and 49316. The Lake Michigan Family Fare*, located at 2755 Lake Michigan Drive NW in Grand Rapids, will deliver to zip codes 49534, 49504, 49507 and 49401. The D&W Fresh Market at Knapp’s Crossing, located at 2022 Apple Orchard Ave. in Grand Rapids, will deliver to zip codes 49506, 49503, 49505, 49525, 49306, 49341 and 49351. Forest Hills Foods, located at 4668 Cascade Road in Grand Rapids, will deliver to zip codes 49301, 49546, 49302 and 49512. Orders are shopped by a team of Fast Lane personal shoppers, who focus on selecting fresh, quality items from each aisle of the store – including beer, wine and spirits. Fast Lane personal shoppers are also SpartanNash associates, allowing the company to own the experience from start to finish and enabling personal shoppers to build relationships with Fast Lane customers and know their preferences. yes accounts are automatically linked to customers’ Fast Lane accounts, allowing for a seamless experience earning rewards and additional savings. Commonly purchased items and past Fast Lane orders are all available online at the same price as in store, making it even easier to clip digital coupons, select commonly purchased items or sort by department, sale items or dietary restrictions when placing an order. Annual and monthly Fast Lane memberships are also available at shopthefastlane.com to provide shoppers with additional savings, regardless of whether they choose at-home delivery or store pickup. 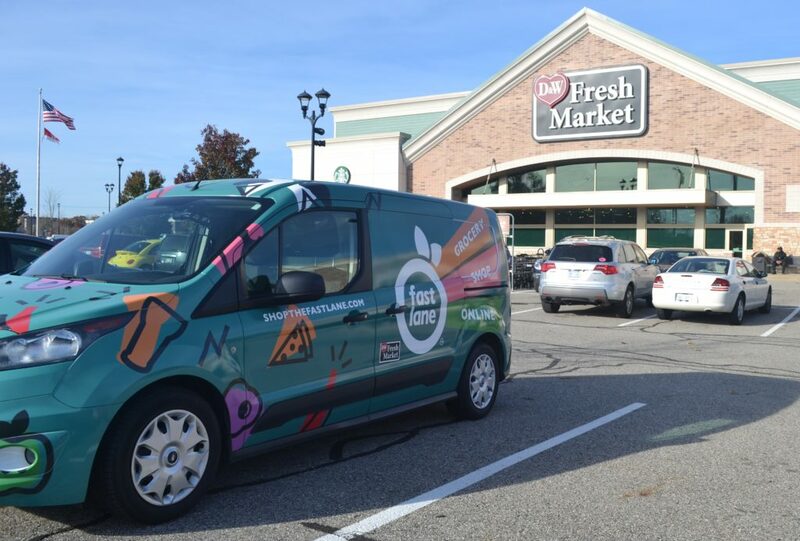 Since launching Fast Lane, the curbside pickup program has quickly expanded and is now available in 46 Family Fare Supermarkets, D&W Fresh Market, Forest Hills Foods and VG’s locations across Michigan and South Dakota. In December 2017, at-home delivery was launched and in February 2018, SpartanNash added the ability to clip digital coupons instantly on shopthefastlane.com, giving customers additional ways to maximize their savings.